Donald Trump, Chris Christie, Charles Kushner, and the George Washington Bridge. A match made in WTF. 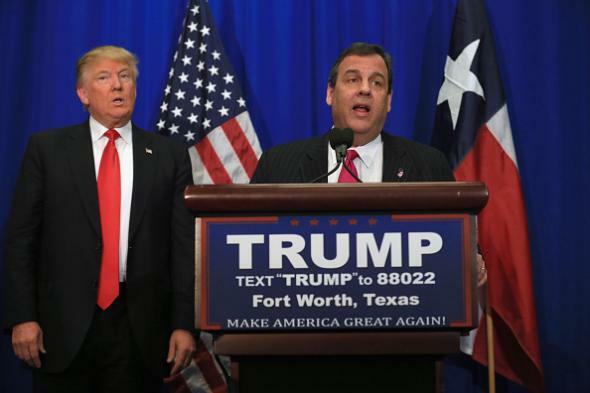 Chris Christie just became the first governor—and by far the most prominent Republican figure—to endorse Donald Trump. On one hand, it makes some sense: Christie is a loud-mouthed national-security Republican who’s willing to occasionally challenge party orthodoxy on certain issues, and at this point that’s a good description of Trump as well. That’s a reference to Christie having prosecuted Kushner, a New Jersey real estate tycoon, in a totally insane early-2000s case that involved Kushner hiring a prostitute to seduce his own brother-in-law and then having a recording of their tryst sent to his (Kushner’s) sister. Kushner was sentenced to two years in prison in 2005 after reaching a plea agreement with Christie. In 2009, Kushner’s son Jared married Trump’s daughter Ivanka. Jared Kushner now frequently appears onstage at Trump campaign events. “They’re closing up the largest bridge in the world—the biggest in the United States—traffic flowing during rush hour,” Trump continued. “People couldn’t get across for six, seven hours. Ambulances. Fire trucks. If any evidence ever turns up that Christie did know in advance about the bridge closing, it would follow that he would get indicted on fraud and conspiracy charges like the other people who were demonstrably involved. So Donald Trump implied Chris Christie could be indicted for public corruption, and Chris Christie once sent a possible Trump Thanksgiving guest to jail for hiring a prostitute to seduce his brother-in-law. These guys and their families are going to have fun campaigning together.